Worked hard this week, so Friday night was time for a movie! First checked out what's playing at the local Oaks and Albany Theaters (Wordplay sounds like fun.. but not just yet).. and then we saw Mission: Impossible III was at the Parkway Speakeasy Theater! Never been there? You're in for a treat! Buy your Pizza, Beer, Popcorn (the basic food groups), stroll into the theater, and select your own personal couch and sidetable. It makes for a very comfortable night... take your shoes off, put them up on the sofa, and enjoy yourself! Like home.. only the screen the Egyptian Motif theater is huge! Have infants... then stop by Monday Nights for Baby Night..."Crying Babies At The Movies"
Coming to a theater near you? That's right. 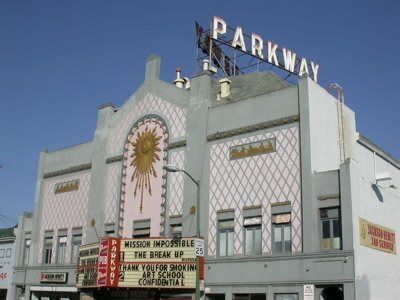 The same folks who host the Parkway Speakeasy Theater will be operating El Cerrito's Art Deco Suprise.. the Cerrito Theater! Consider buying an El Cerrito home! You'll get a lot of home for your money. Here's what's for sale in El Cerrito this very moment. Just read a nice article in the Berkeley Daily Planet by Marta Yamamoto titled "At Home in Northbrae". She talks about all our favorite Northbrae Neighborhood haunts.... Espresso Roma, Monterey Market, North Berkeley Library (though I didn't see a reference to Gioia Pizza, which both I, and my neice Melanie, have dubbed "Berkeley's Most Like New York Pizza)"
Northbrae is a particularly lovely neighborhood to live in. The markets purvey Berkeley's essential five groups - coffee, beer, produce, meat, and fish. It's an easy walk to the North Berkeley BART Station.. and direct buses to San Francisco. The pleasures of Solano Avenue, North Berkeley, and the North Berkeley Library are just a short stroll away. Want to live in the Northbrae Neighborhood? Here's what's for sale in Northbrae right now! That's the title of a marvelous book by Jane Jacobs. I grew up in New York City in the 50's and 60's... and saw the effect that construction of the Cross Bronx Expressway ... and the high rise "projects" had on communities. My father had a furniture store at 759 East 149th Street in the South Bronx, and I used to help him load mattresses, dining room tables, and chairs atop the 1949 Green Pontiac to deliver to the high rise "projects". Even when I was young, I knew I never wanted to live there.... and always looked forward to returning to our Pelham Parkway neighborhood (2106 Bronx Park East, to be specific). Today was a particularly warm day in Berkeley. It was 90 degrees by 11 am, and Carol and I decided to take a break our Broker's Tour and stop at 4th Street. First a pilgrimage to Cody's Books on 4th, then the Builder's Booksource, a visit to our moving van to make sure the parking tags were current, and finally a stop at the San Pablo Poultry Store on San Pablo Avenue. What does one thing have to do with another? 4th Street is much more upscale than Lydig Avenue in The Bronx.. but both streets were filled with people walking, talking, shopping, and dining! SFGate.com has an excellent article on Berkeley's San Pablo Corridor. Check it out! That's the title of my new book.. and the cover just came in! Thinking of selling? The tips in my new book make the sale of your home easier, and show you how to receive thousands of dollars more when selling. 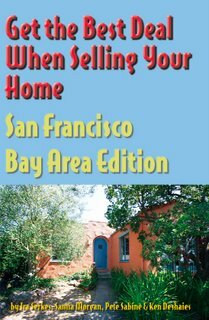 I've always wanted to write the companion book to my Nolo Press Book "How To Buy A House In California"... and it should soon be in bookstores. Need the information right away? Call 510-526-6668 or email serkes@berkeleyhomes.com and we'll get together! Here comes the sun... power! It's 21 Jun 2006... the summer solstice! Hope your summer is a delightful one. In just a few days, our 4,080 Peak Watt Photo Voltaic system will be installed at Casa Serkes! We've been very pleased with how thorough the friendly folks at Sun Light And Power have been. When I went to their Berkeley office last week, I noticed their PG&E meter. It was running backwards! We're looking forward to playing an important role in reducing global warming. Just saw an article in the San Francisco Chronicle about a Rockridge Home.. and it's tale of two paint jobs. It's worth reading, so here's the link to it! It talked about the wrong.. and right way to select paint colors. The article made me smile! Many many years ago my investment partner and I selected colors to paint one of our rental houses. He didn't like my selection.. I didn't like his.. and we compromised. We ended up with colors neither of us liked! As I mentioned.. that was many years ago. Now I know to bring in a color consultant! When you're ready to sell your house in Oakland's Rockridge Neighborhood... or Elmwood Claremont... or any of our marvelous East Bay communities, give us a call! It would be our pleasure to refer you to experts in the "Art of Staging" Staging was first developed by Barb Schwarz, and I wanted to make sure that she receives the credit for this superb concept. Want to buy your own Rockridge Home? Here's what's for sale in Oakland's Rockridge neighborhood... and Berkeley's nearby Claremont neighborhood. Today was a beautiful day in Berkeley... and we decided to take advantage of the warm summer night to walk to dinner. We left our Thousand Oaks home and headed up one of our favorite streets... Vincente Avenue. When we reached Visalia, Carol said.. it's so nice out, let's go to the cul-de-sac at the end of the street. The Berkeley Path Wanderers Association created a marvelous maps of all the paths in Berkeley.. and we knew that one of them led from the end of Vincente up to The Alameda. 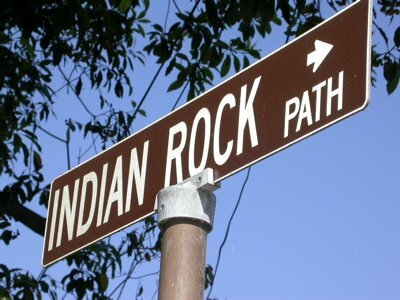 The photo is of Indian Rock Path, which takes you from the top of Solano Avenue to... Indian Rock! What we didn't expect (and weren't suprised to see) were the fauna! First.. we saw a deer head down into the canyon, then a very friendly black and white cat came to welcome us.. and as we looked up the path, saw a fawn... and its mom! Then down Visalia, across County Boundaries into Kensington's Circus Pub for a Black & Tan.. and Fish & Chips. Growing up on Bronx Park East, the only animals I saw lived at The Bronx Zoo across the street. It's a treat to call home the Thousand Oaks neighborhood... along with friendly 4 legged friends! 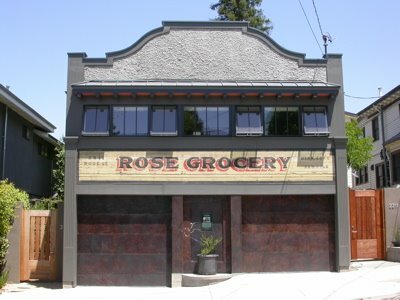 Thursday's our broker's tour... we stopped to see a North Berkeley home... and parked across from the Rose Market. Imagine our delight when we were out on tour about a year ago, and saw its miraculous transformation! David Trachtenberg preserved the sign, built two superb condos behind it, and gave Berkeley a real gift to the street. 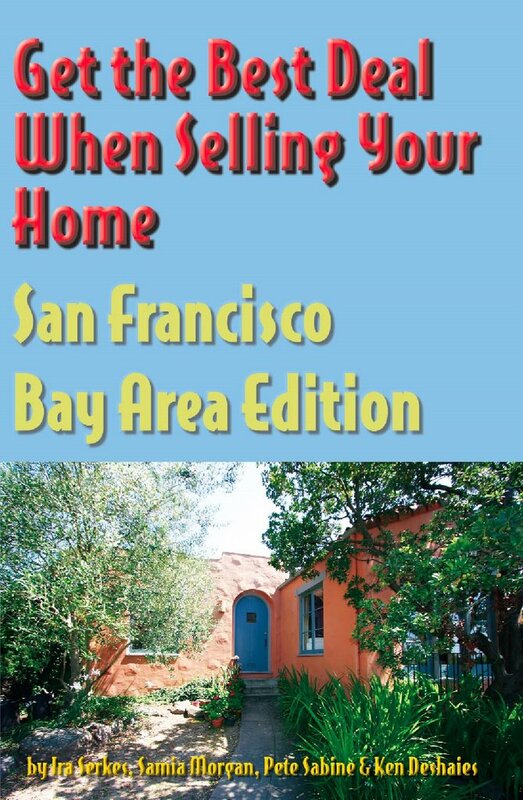 Interested in buying a North Berkeley home? Here's what's available right now! I'm sitting at a Berkeley real estate association meeting and learning some very cool things about the City of Berkeley web site. Are you a map lover? Then surf to the Map Room.. you'll find an amazing selection of maps - zoning, creeks, landmarks, parking. I can see spending a lot of time here myself! After working out at the Berkeley YMCA (one of the wonderful institutions of Berkeley), I stopped to pick up mail at our Post Office Box on Solano Avenue. Who did I meet but Carol ... and Alex Yaskin, the roaming accordianist! So, we put some money in his tip jar, and I asked him to serenade us. Carol chose "The Girl From Ipanema". Imagine the scene... Carol (born in Newcastle-On-Tyne) and Ira (born in Manhattan), being serenaded on the accordian with a Brazilian Bossa Nova song by Alex (from Russia) in Berkeley California. Want Alex to play music for one of your parties... ring up his cell phone at 510-484-5952 and tell him Ira & Carol referred him. Just one of the many reasons I love living in Berkeley! 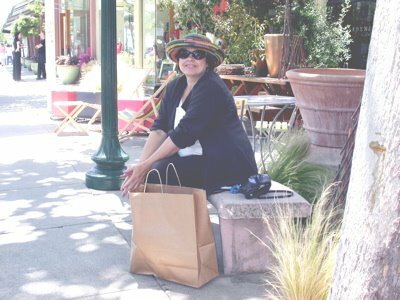 Want to shop on Solano Avenue? 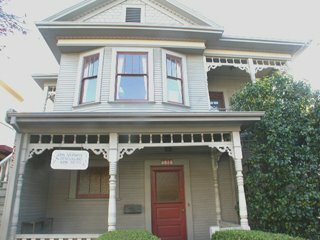 Buy a Kensington or Albany Home, or one of the Berkeley houses in the Thousand Oaks, Northbrae, or Berkeley Hills Neighborhoods. The best Bloggers I know! I network and mastermind with the most creative and productive real estate agents in the industry. Here's where to click when you're interested in what's happening in other North American Real Estate Markets! Just read that BART will be charging parking fees at their 10 most popular stations... and North Berkeley BART is one of them. More details in "Dump The Pump" from the San Francisco Business Times. Considering one of our North Berkley homes? Pick up a residential parking permit. Here's where to go for the "City of Berkeley Residential Preferential Parking (RPP) Program" (that's the official name! New & Cool.. search for homes using maps! Beta? Yes... it's still slow, and it only plays well with Firefox on Mac OSX.. but it's very cool! So.. whether you're looking for the perfect home in Elmwood Claremont, a short stroll to Elmwood Shops or the Claremont Hotel... and want a home in the Berkeley Hills with spectacular views of San Francisco Bay... or want the perfect house in North Berkeley... or the Thousand Oaks neighborhood.. you now can do the search you always wanted to. Visit our web site... and be sure to let us know which piece of Berkeley Real Estate you'd like to buy. Email serkes@berkeleyhomes.com or call 510-526-6668 and leave a detailed message... we'll get back to you as soon as we can. Before I bought my first property I lived in the Berkeley Hills, and always admired a home down the street. it's had several price drops. About the same time, we wrote an offer for clients on a different home - and that one received 16 offers! Oh.. and that first property.. I couldn't afford a single family home, so bought a 7 plex. The details: A two 2+ bedroom 1+ bath rental units in the heart of North Berkeley! How to get there? Well.. here's how I do it. Stop at French Hotel and ask Angel for a Giant Cappuchino (low fat milk). If he likes you he might just create artwork atop the foam. Keep walking north on Shattuck, stop at the Cheese Board for the best pizza in the world... then step into the Cheese Board coop for a crisp baguette, and olives. Walk to The Produce Center on the corner for fresh tofu, cherry tomatoes, and figs... round the corner and you're home! Other alternatives - coffee at the Peet's flagship store on the corner of Walnut & Vine, a browse through Black Oak Books, and a pastrami, latke and egg cream at Saul's. Or... get some take out at Epicurious Garden. Need to go to work? Stroll down Shattuck to the downtown Berkeley BART station or just take the corner bus. I got started by buying a 7 plex... you can start your real estate portfolio with this superbly located property!